The economic liberalization of 1991 accelerated the pace of industrialization in India, setting the manufacturing activities in a notable momentum. This change has been the primary growth driver for the whopping energy demand in the country. However, the inconsistency in the supply of energy and the growing pressure of conserving has led to a high adoption of static synchronous compensator STATCOM UPS. The units help in the regulation of voltage and correction of power factor, both of which are essential to the smooth functioning of manufacturing units. A research report published by Transparency Market Research suggests that the opportunity in the India STATCOM UPS market will be worth US$113.9 mn by 2024 from US$27 mn in 2014, expanding at an impressive CAGR of 16.0% from 2016 to 2024. The rise in the India STATCOM UPS market will be due to the power deficit in the country and the need to save on overall energy consumption. Analysts predict that the ability of STATCOM UPS units to manage voltage fluctuations and harmonic distortions seen in power supplies will boost their demand amongst various industries. For instance, utilities are deploying STATCOM for compensating refining power factor and reactive power in the transmission and distribution network. The most popular product in the overall market is the insulated gate bipolar transistors (IGBT) STATCOM UPS. By the end of 2024, this product segment is anticipated to hold a share of 88.8% in the India STATCOM UPS market from 78.0% in 2014. The impressive growth of IGBT-based STATCOM UPS will be due to its increasing usage in real and reactive power. Furthermore, it is also being acknowledged as an acceptable technology across various industrial platforms. STATCOM UPS systems are used for a wide range of applications such as offshore oil and gas, power distribution, power transmission, steel manufacturing, mining, and automobile manufacturing. The report suggests that long distance power transmission and power substations are significant users of STATCOM UPS as the Indian government is pumping in money to improve power transmission and distribution channels across the country. Furthermore, initiatives such as Make in India will also push the manufacturing movement in India, thereby creating a positive impact on the growth of the India STATCOM UPS market. The presence of heavy industries such as mining and steel industries is propelling the demand for STATCOM UPS in the eastern and western states of India. Though these regions have been using static VAR compensator (SVC) UPS technology for regulating voltages and power factor correction, they are making a gradual shift towards STATCOM UPS due to the reliable and stable power solutions it offers. The key players in the India STATCOM UPS market are General Electric India Ltd., Bharat Heavy Electricals Limited (BHEL), NR Energy Solutions India Pvt. Ltd., ABB India Limited, Crompton Greaves Limited, Schneider Electric India Pvt. Ltd., Mitsubishi Electric India Pvt. Ltd., Signotron India Pvt. Ltd., Veeral Controls Pvt. Ltd., and Power One Micro Systems Pvt. Ltd. Research indicates that these players will have to build stronger brand images and make meaningful investments to bring their research and development to fruition to gain a substantial revenue share. This research study analyzes the market for STATCOM UPS in India in terms of revenue (US$ Mn). The STATCOM UPS market has been segmented on the basis of product, application, and geography. The geographical segmentation includes four regions. For the research, 2014 has been taken as the base year, while all forecasts have been given for the period from 2016 to 2024. Market data for all the segments has been provided at the regional level from 2016 to 2024. The report provides a broad competitive analysis of companies engaged in the STATCOM UPS business. The report also includes the key market dynamics such as drivers, restraints, and opportunities affecting the STATCOM UPS market in India. These market dynamics were analyzed in detail and are illustrated in the report with the help of supporting graphs and tables. The report also provides a comprehensive analysis of the STATCOM UPS market in India with the help of Porter’s Five Forces model. This analysis helps in understanding the five major forces that affect the structure and profitability of the market. The forces analyzed are bargaining power of buyers, bargaining power of suppliers, threat of new entrants, threat of substitutes, and degree of competition. The report also provides product differentiation for different STATCOM UPS technologies. The high-level analysis in the report provides detailed insights into the STATCOM UPS business in India. There are currently numerous drivers of the market. The most prominent drivers include growing industrial sector coupled with increasing demand for power. Market attractiveness analysis was carried out for the STATCOM UPS market on the basis of end-use. Market attractiveness was estimated on the basis of common parameters that directly impact the market in different regions. The STATCOM UPS market was segmented on the basis of product type (insulated gate bipolar transistor (IGBT) based STATCOM UPS and gate turn off thyristors (GTO) based STATCOM UPS), application (long distance power transmission, power distribution, oil and gas offshore platforms, steel manufacturing, mining, and the automobile industry) and geography. 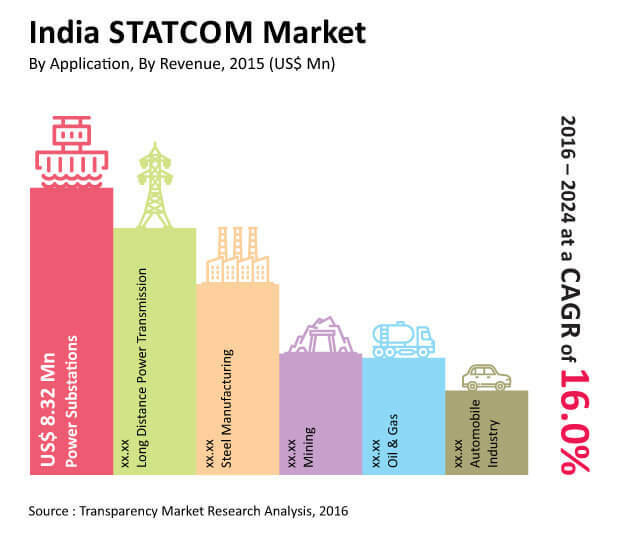 The STATCOM UPS market in India was analyzed across four regions: East India, West India, North India, and South India. Key players in the STATCOM UPS market include Bharat Heavy Electricals Limited (BHEL), ABB India Limited, Crompton Greaves Limited, Schneider Electric India Pvt. Ltd., General Electric India Ltd., Mitsubishi Electric India Pvt. Ltd., Signotron India Pvt. Ltd., Power One Micro Systems Pvt. Ltd., Veeral Controls Pvt. Ltd., and NR Energy Solutions India Pvt. Ltd.